Today’s delicious post is sponsored by Reynolds®. In case you haven’t noticed, we use their products in probably half of our recipes. Hello parchment paper, baking cups and aluminum foil! So when they asked if I wanted to try their new product, I was like “Yargs yes! I want to try them!” But, not in those words exactly because I didn’t want to sound unprofessional ofcourse. Let’s talk creamy spinach artichoke pasta. 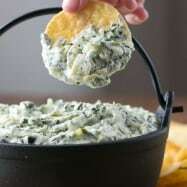 My spinach and artichoke dip is arguably one of the most popular spinach and artichoke dip recipes on Pinterest (Pinned over 1,200,000 times). Everyone loves it! 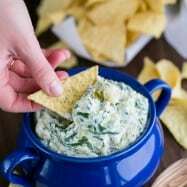 One of my readers, Joan, wrote in saying, “I threw away every other recipe I had for spinach and artichoke dip once I tasted this one! Fabulous!” Then she suggested I try it with penne pasta and went on and on about how great it was. So I did. Then I wrote a song; “Joan, your pasta was awesome and really saucesome. Thanks for sharing it with me, it’s so yummy…” I’m really glad you’re reading that instead of hearing it. But seriously I’ve got this rhyming thing down pat! Can you tell I just ate a big bowl of spinach and artichoke pasta? 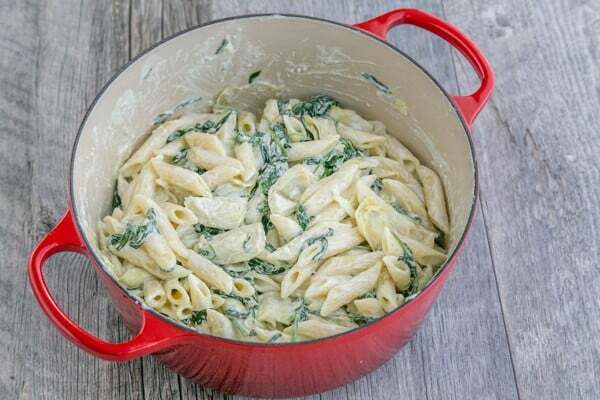 I cut the original spinach and artichoke dip recipe in half and it was plenty for this pasta sauce. * Also, I used fresh spinach but you can totally use frozen, just be sure to thaw it and squeeze out the excess moisture with your hands. 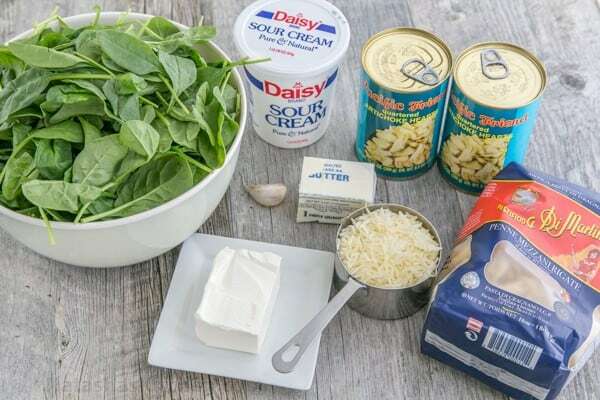 If using frozen, you can skip step 2 and add the spinach in at step 4. 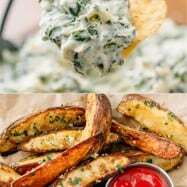 You may use reduced fat cream cheese or low fat sour cream. 1.Cook pasta in a large pot of salted water to desired doneness (I added 1/2 Tbsp salt for a soup pot half filled with water. Drain pasta and reserve about 1 cup of the pasta water (DON’T FORGET). 2. In a large pot, melt 2 Tbsp butter over medium heat. Once hot, add spinach and stir until slightly wilted. The spinach wilts fast (about 1 minute) and I might have overdone it because I was snapping the picture rather than removing it right away. Notice how much it shrinks – wild eh?! Transfer wilted spinach to a colander and let it drain while preparing the rest of the recipe. 3. Add 4 Tbsp butter to the same now empty pot along with 4 oz cream cheese cut into pieces, 1 cup sour cream and 1 cup parmesan and stir until everything melts together and starts to bubble. 4. Stir in drained artichokes and cook an additional 1-2 min then add drained spinach, pressed garlic and jalapeños (if using). Cook until hot then toss in the cooked, drained pasta. 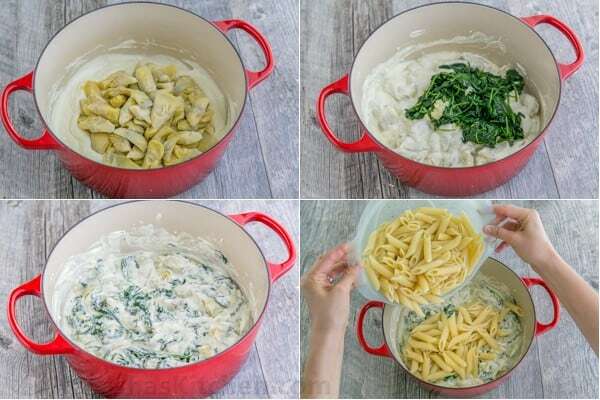 Stir in reserved pasta water if desired (I added at least 1/2 cup of the pasta cooking liquid – this makes the sauce a little lighter and creamier and helps to keep the pasta moist when it’s reheated). This pasta reheats well. Transfer into Reynolds® heat & eat disposable containers and you’ll have lunch for work or an after school lunch date with your son :). I also use them as to-go containers for sending leftovers home with family or friends. You can freeze, refrigerate and microwave your food right in these containers (just be sure to remove the lid before microwaving). And I love that they are BPA free and made of renewable plant fibers; a safe alternative to plastic. Just to clarify though, don’t eat the container. Tip: If you’re reheating in the microwave, sprinkle your food with a bit of water and it will turn out so much better and juicier. 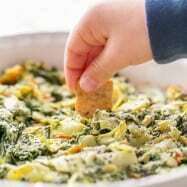 This recipe has all of the great familiar flavors of spinach and artichoke dip in the comfort of a bowl of pasta. A 30 minute meal! Cook pasta in a large pot of salted water to desired doneness (I added 1/2 Tbsp salt for a soup pot half filled with water. Drain pasta and reserve about 1 cup of the pasta water (DONT FORGET). In a large pot, melt 2 Tbsp butter over medium heat. Once hot, add spinach and stir until slightly wilted. The spinach wilts fast (about 1 minute) and I might have overdone it because I was snapping the picture rather than removing it right away. Notice how much it shrinks - wild eh?! 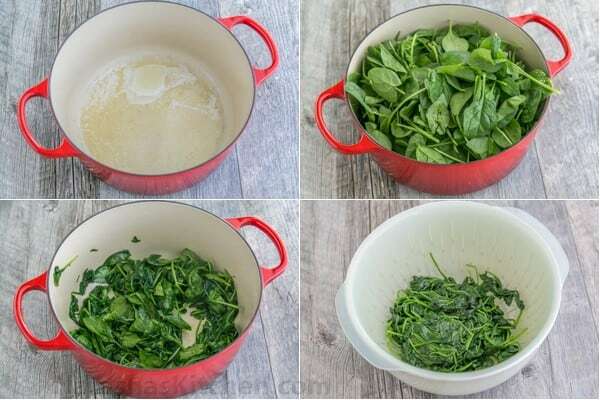 Transfer wilted spinach to a colander and let it drain while preparing the rest of the recipe. 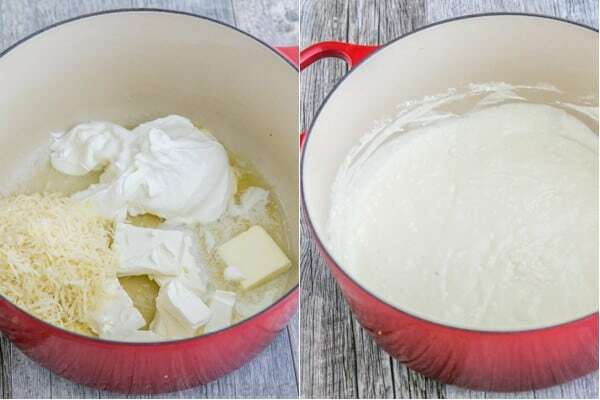 Add 4 Tbsp butter to the same now empty pot along with 4 oz cream cheese cut into pieces, 1 cup sour cream and 1 cup parmesan and stir until everything melts together and starts to bubble. Stir in drained artichokes and cook an additional 1-2 min then add drained spinach, pressed garlic and jalapeños (if using). Cook until hot then toss in the cooked, drained pasta. 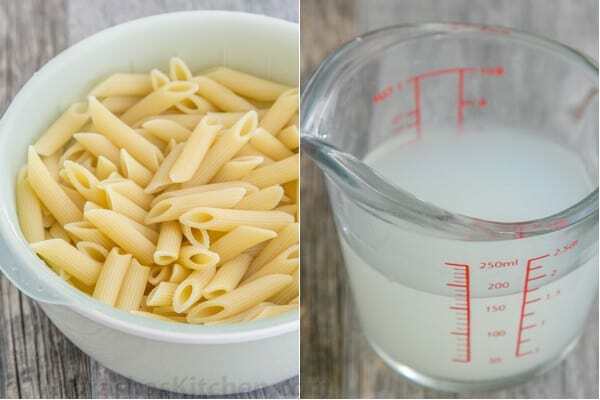 Stir in reserved pasta water if desired (I added at least 1/2 cup of the pasta cooking liquid - this makes the sauce a little lighter and creamier and helps to keep the pasta moist when it's reheated). 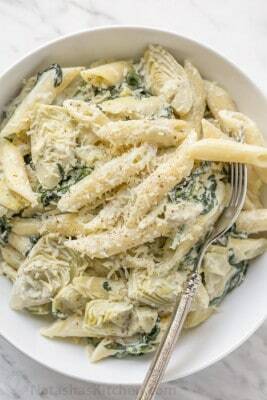 On substitutions: I cut the original spinach and artichoke dip recipe in half and it was plenty for this pasta sauce. * Also, I used fresh spinach but you can totally use frozen, just be sure to thaw it and squeeze out the excess moisture with your hands. If using frozen, you can skip step 2 and add the spinach in at step 4. 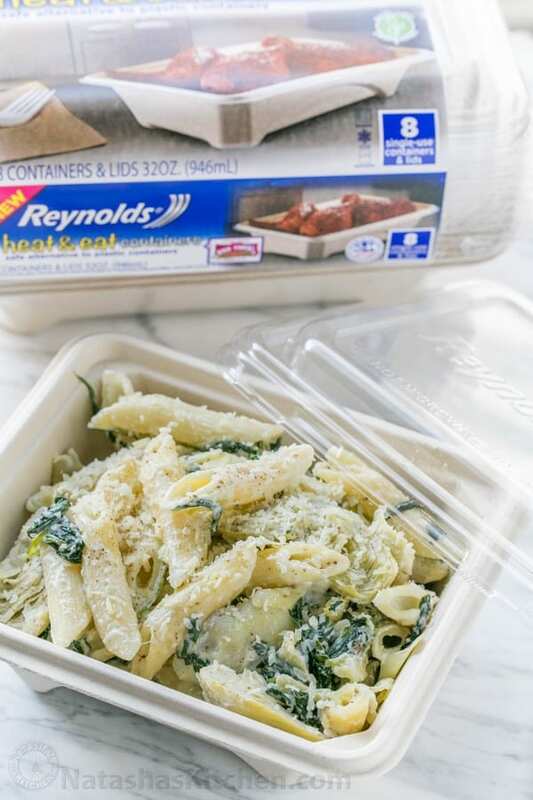 Full disclosure, because it’s the law: Reynolds® sent me their containers to try (they even packaged them in a pretend microwave that my son swiftly claimed). All opinions are my own and I think these containers are great! All you chickens should stock up (we call the kids “chickens” so really it is a very endearing term, you’ll just have to take my word for it). 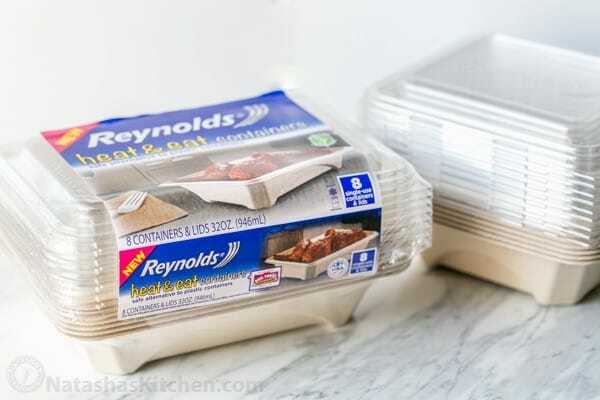 Reynolds® heat and eat disposable containers are sold at Target, come in 2 sizes and are only $3.99 per stack. Recognized one of your recipes while I was reading this buzzfeed article! 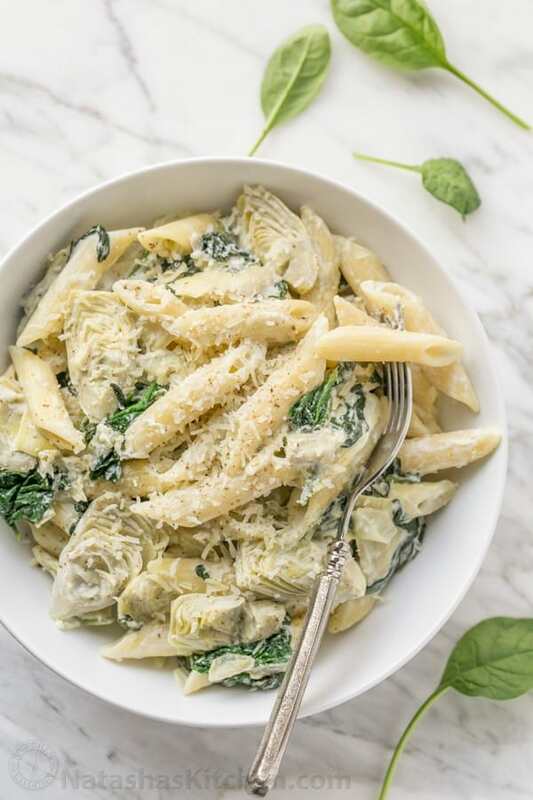 If I wanted to add chicken to this recipe, would you recommend just cooking it on the stove top in bits and add it to the pasta? Hi, Natasha ! 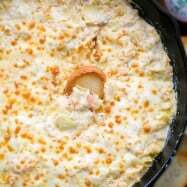 I ‘ve used many recipes from your website , they all came out just perfect, so I trust you a lot . thank you for your hard work, you help me a lot , when I dont know what to cook.. 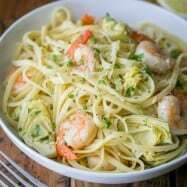 Please, please, do you have good checken alfredo recipe you can share ?